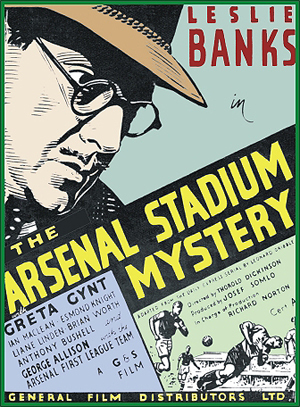 THE ARSENAL STADIUM MYSTERY (1939) Leslie Banks, Greta Gynt, Ian McLean, Liane Linden, Anthony Bushnell. A star English football player collapses right on the field during a big game. When the dust settles, it’s discovered that the player was murdered! But how…and by who? Enter a snappy but serious police inspector played brilliantly by Banks, who spends the rest of the film tracking down the killer, who kills again before the end of the film. Great fun with any number of nice tongue and cheek moments. Bravura performances by all. 16mm.